President-elect Donald Trump says that he would like to keep some of the “good parts” of Obamacare. High on that list is the ban on insurers discriminating against Americans with pre-existing medical conditions by either denying them coverage or charging exorbitant premiums. But with mounting uncertainty about how Trump and the GOP intend to repeal much of the Obamacare law next month without a replacement plan in hand, the plight of millions of Americans with pre-existing medical conditions is a very big question mark. A new Kaiser Family Foundation study released Monday estimates there were at least 52 million Americans under the age of 65 who had pre-existing medical conditions that would have rendered many of them uninsurable before the Affordable Care Act took effect in 2014. That means that about 27 percent of all adult Americans under the Medicare age of 65 potentially could have trouble finding new coverage in the future if they lose their existing policies under Obamacare, expanded Medicaid for low-income people or through an employer. The study was based on a review of extensive national health care data, including the National Health Interview Survey (NHIS) and the Behavioral Risk Factor Surveillance System. Some health care experts warn that even if the Republicans manage to preserve that protection against discrimination for the next two years or so, while they attempt to thrash out the details of a replacement plan, major insurers like UnitedHealthcare, Aetna and Blue Cross-Blue Shield are likely to accelerate their departure from the Obamacare market or substantially jack up their premiums. That would effectively shrink the availability of coverage for people with preexisting conditions. And it would mean that many of them may have trouble finding replacement coverage in the future if they lose their existing policies obtained under the Affordable Care Act, through expanded Medicaid or through an employer. “Unfortunately, there’s no magic pixie dust to make that easy or avoid difficult tradeoffs,” Larry Levitt, a senior vice president with the Kaiser Family Foundation, wrote on Monday in the Los Angeles Times. He was describing the likelihood of a “death spiral” in the Obamacare insurance market if the Republicans make good on their pledge to repeal Obamacare in January with no replacement plan in mind. Before the advent of Obamacare, insurers routinely assessed the health status, health history and other risk factors in determining whether to grant coverage, and many times applications were rejected. Prior to the ACA’s coverage expansions, Kaiser estimated that 18% of applicants were denied coverage in the individual market. Kaiser said its findings on the number of Americans with pre-existing conditions were on the “conservative” side, because the surveys they used do not include sufficient details on several conditions such as AIDS or hepatitis C that would have been “declinable” by many insurers before enactment of the ACA. There are dozens of health conditions that would have ruled out obtaining coverage in the past, including multiple sclerosis, arthritis, epilepsy, stroke, mental disorders and obesity. And besides declinable conditions, many insurers also maintained lists of declinable prescription medications. Current use of any of those medications by an applicant would have almost certainly led to them being denied coverage. And notably, the rates of “declinable pre-existing conditions” varied greatly from state to state. 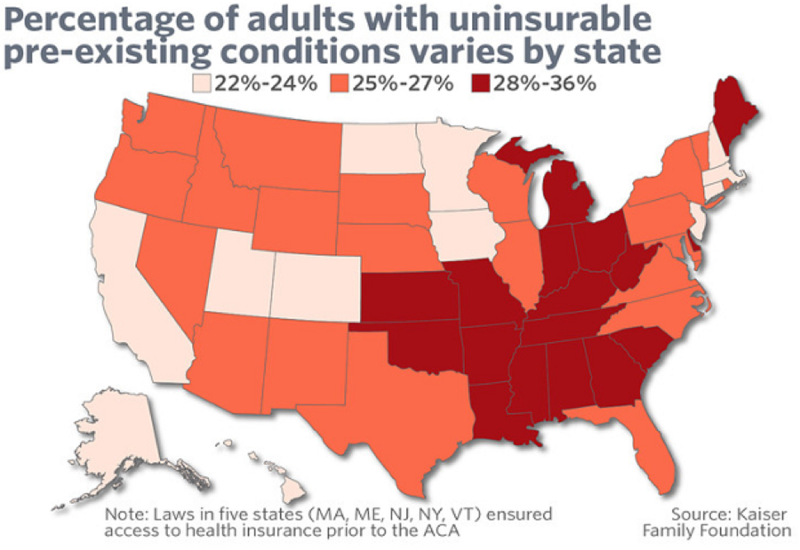 The low end, the study found, were in states including Alaska, Colorado, Massachusetts and Minnesota, where only 22 percent to 24 percent of adults had conditions that likely would have prevented them from obtaining coverage in the past. The declinable pre-existing rates were much higher in other regions, especially among Southern states that frequently fare poorly in public health surveys. For example, Tennessee, Arkansas, Alabama, Kentucky, Mississippi and West Virginia all have declinable pre-existing rates of between 32 percent and 36 percent. SOURCE: Kaiser Family Foundation analysis of data from National Health Interview Survey and the Behavioral Risk Factor Surveillance System. NOTE: Five states (MA, ME, NJ, NY, VT) had broadly applicable guaranteed access to insurance before the ACA. What protections might exist in these or other states under a repeal and replace scenario is unclear.